Quick Column Quilts: Make 12+ Bold & Beautiful Designs in Half the Time. You can find more information about the tour here. 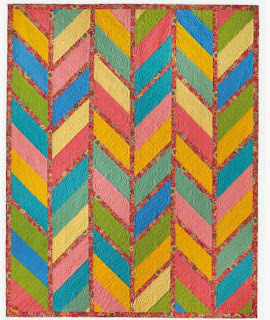 Happy- Go- Lucky Chevron Column Quilt on page 54.
of solids which you can check out here. using white as the contrasting color to pop and showcase not only the color but the design. One of the most clever things I learned from the instructions, for this pattern, is how to sew my strips together. They are sewn one direction for one column and then reverse for the other column. When you cut the column in half that gives you your top and bottom straight edge. there is no waste!!! Brilliant!!! The finished look is bold and modern. This is just one of the 12 quilts in the book. complicated design using a simple sewing technique. Nancy has shared and written this book with a modern approach to quilting...using bold beautiful designs and making them in half the time! 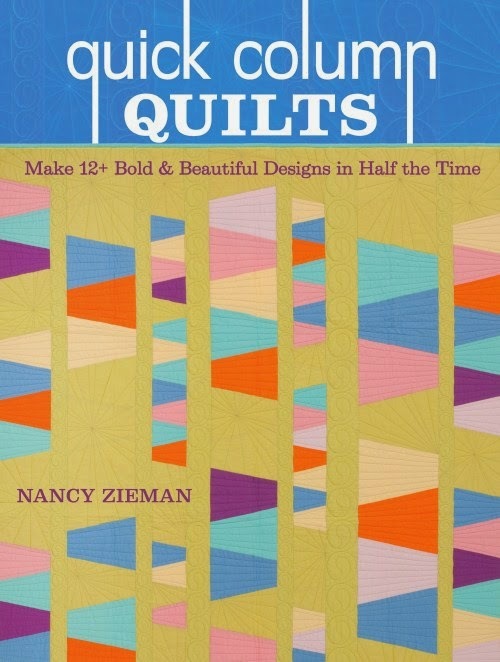 If you would like to win one of Nancy's new "Quick Column Quilts" Books, be sure to leave a comment. You will love this book! The giveaway here, starts now. A winner will be announced after the blog tour is finished on September 18th. Below is the full tour... be sure to check out everyone's blog post. Nancy Zieman is pleased to announce that 27 bloggers will feature various projects or techniques from Quick Column Quilts, starting September 4 and ending September 17th. Please follow along! This looks like a fun book and your quilt is beautiful. I haven't seen that particular color combination before but I really like it. Its so super pretty in the solid color pathway you used. It turned out amazing. Jina, what a lovely quilt! As others have noted, your color combo is top notch. Normally I am not a big fan of grey but your quilt turned out wonderful. I am going to like this book a lot. Hummmm...that might be the best way to do a chevron yet! Nice quilt. I like the colors you chose. Your color choice is so contemporary! Really makes this quilt wonderfully modern! Just love your quilt and the colors you chose. Thank you for this special giveaway! I watch you all the time - over and over - thank you for the giveaway. LOVE your colour selections with this one! Thanks again. I love that you used solids for this chevron. I can hardly wait for the opportunity to make another of Nancy's quilts. She is amazing. Your quilt is stunning; love the colors and the design. LOVE the broken take on Chevron's. And your color choice....oh.my! It's absolutely beautiful! I would love a chance to win Nancy's book. Thanks for the inspiration and post! Lovely quilt - thanks for sharing & thanks for the chance to win. Gorgeous colors in your quilt. Thanks for the chance to win the book! What a great idea for quilts. They are fabulous. Love the modern look of your quilt! Thanks for sharing. Love your color combination. A truly beautiful quilt. I'm thinking there will be a column quilt in my future!! Oh Wow - your quilt turned out so gorgeous! Nancy's book has me inspired! Your choice and arrangement of colors is fabulous. Wow, your solid combination of fabrics is beautiful. I love this quilt in particular! your version is beautiful, although i don't use solids much (kids, grandkids, dogs, cats), i do love that you could and did! thanks! Love the modern look of this. Also love the pattern and angles. Love the colors in your quilt, so cozy and peaceful. Can't wait to try some of Nancy's new patterns! I love the colours in your quilt. It's so bold and striking with solids too! Beautiful colors you picked for your quilt. Thanks for the chance. Love what I can preview of the book. I do a lot of charity quilting for the Santa Train and wounded military men and women. I am always looking for new ideas. Looks amazing! I would love to win! Like your color choices, very calming. It allows a whole different look to the pattern and I also like that you told us what you learned making the pattern. It is helpful to know that there are tips included in the instructions. Her column quilts are exactly what I'm looking for to finally make myself a comforter for myself. So far I've given away or sold everything I've ever made. I think I need to add this book to my must-have list. Your quilt looks great, I love the colours you chose. I love the colors in your quilt. The pattern is so uncluttered and appealing. I absolutely love the colors in your quilt. So soothing. Jina I love your colour choices - very modern and original. Enjoying the blog tour for Nancy's new book ... some lovely and inspirational quilts. Your Chevron quilt is beautiful. I love the colors you chose. Just goes to show us that you can make beautiful quilts in lots of designs with the right choice of fabrics. Thanks for sharing your lovely quilt. Your quilt is very pretty. I think I could sew one too! Would love to win! I like what you've done with the quilt pattern you chose. Lovely choice of colors. Love the colors you picked! The book looks so interesting. Thanks for the opportunity to win! That is a gorgeous quilt. Love the color combination. Thanks. Your quilt is gorgeous. I'd love to try this pattern. Your pinks and grays make a gorgeous chevron quilt. I would be thrilled to win this book, thanks for the chance. Beautiful! Love the color selection. I love the fabrics and pattern of your quilt. I've been a fan of Nancy's for 30 years, and have been inspired by all of her books. I would love to win this newest book to add to my collection, and my skills. Beautiful colors. Just gave me inspiration for new quilt Thanks! I love how your quilt is modern and soft at the same time, thanks to the colours you chose. I'm always looking for tips on not wasting fabric! Love the colors of your column quilt. Quite lovely! I love the solids you chose for your quilt. I would love this book -- anything quick is a good thing in my life right now. I didn't think I was a fan of modern style quilts, but I should have known it would be Nancy Z who would change my mind! Wow! Your quilt is divine! Just lovely! And I love anything Nancy does. Always easy and excellent! I just love this book!!!! !